We all get anxious at some points in our lives but some of us are more anxious than others. 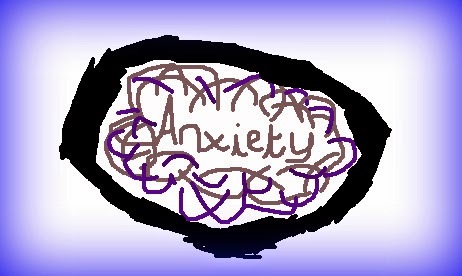 While there are different types of anxiety disorders I have never named my anxiety. What I mean by this is I have never been to the doctors and spoke about my anxiety for someone to tell me what it is I suffer from; maybe I should but I haven't. I have always been a shy worrying child but it is only since I have grown up that I've considered that I suffer with anxiety. I am an overthinker who lets my anxious mind stop me from making the most of my life; this is how I suffer. I worry every day about little things that seem silly to a lot of people and I sometimes avoid situations because I'm just too anxious. I really suffered with it not so long ago where a situation of unemployment + anxiety + hopelessness = depression (I'll speak about this again in another post some time). It was a really tough time and I'm glad I'm getting better but anxiety still affects me. Anxiety, for me, is an uncontrollable and overwhelming record of worries repeating over and over and over in my head like a bad song.